Salting is a common way of conservation, thanks to which you can eat vegetables until the very spring. Sodium chloride blocks the growth and reproduction of microorganisms that provoke decay. The technology of this method is almost the same for all vegetables, however tomatoes require a special approach. What are the recipes for pickling tomatoes for the winter to choose, and how to make the taste of the billet unforgettable? Отзывы: «Почти как бабушка делала» 5 Reviews: "Almost like my grandmother did"
It's hard to believe that a couple of centuries ago this vegetable in Russia was considered inedible and useless overseas "wonders". Even there was a misconception about the virulence of the fruit. But today, the agricultural population totals more than 2 thousand species. How to understand such a variety and choose the "right" tomatoes? After all, it is so important to preserve the shape and juiciness of the vegetable when pickling. Tomatoes, unlike some vegetables, for example, cucumbers or zucchini, have their own unique flavor bouquet. In order not to muffle the taste and aroma of tomatoes, when salting them, you need to use about half the spices than when preserving the same cucumbers. Quality salting of tomatoes requires compliance with four rules. Do not use a large container. Solid cucumbers can be salted in large containers, even in a barrel. For tomatoes, it is desirable to use a smaller dish - a capacity of 1-10 liters. Because under their own weight they are deformed. Make a stronger brine. The concentration of sugar in tomatoes is higher than in cucumbers, therefore more salt is needed for preservation. Traditionally, brine for green fruits is done by observing a ratio of 300-400 g per 5 liters of water, and for ripe - 250-350 g.
Correctly calculate the ratio. Usually the quantity of fruits and brine occupies half the volume of dishes: 1.5 liters of fruit and 1.5 liters of brine are placed in a three-liter container. It is possible to deviate from this index by 100 g (or 100 ml) with increasing or decreasing density of the masonry. Consider the duration of the fermentation process. Fermentation lasts about two weeks at a temperature of 15-20 ° C (with a cold method). This is due to the fact that in tomatoes, especially unripe, accumulates a poisonous substance - solanine. 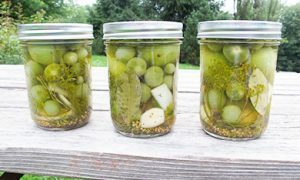 Store pickles recommended at a temperature of 0-2 ° C.
Choosing the "material" for future harvesting, carefully inspect the fruit. The course must go unspoiled, the skin of which has no damage. It is worth paying attention to two more nuances. Preference is plum form. These fruits are covered with a dense skin that does not allow them to deform during conservation, and at the same time they are juicy and fleshy inside. Perfect for salting such varieties of tomatoes: Humbert, Mayak, Gribovsky, Fakel, Novinka, De Baro, Titan, Ermak, Bizon. Degree of maturity. Perfectly keep the shape of green tomatoes, as well as medium ripeness. However, it is possible to salted and mature, red fruits, however, you should treat them with caution. 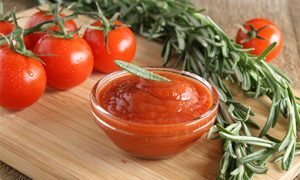 Tomatoes are better salted, if you put in one jar the fruits of one kind and about the same size. 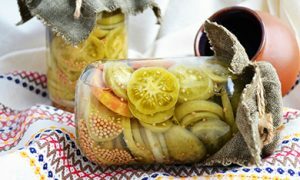 To keep the tomatoes strong and resilient, leaves of oak and cherry are thrown into the container with pickles, which contain a lot of tannins. 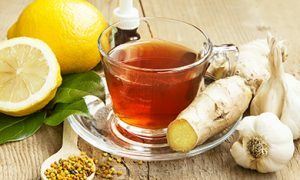 – целые плоды засаливаются в томатном пюре. without brine - whole fruits are salted in tomato puree. Each of these methods has its own specifics, which is reflected in the table below. In the recipes proposed below, except for the latter, the brine is prepared equally. Salt, for better dissolution, is poured with half a glass of hot water, diluted with the remaining cold according to the prescription. The brine settles and is filtered out through the gauze folded in several layers. Features. This "grandma's" recipe has been unchanged for several generations. The main rule is tomatoes and nothing but them. Well, except that a couple of spices for flavor. currant leaves - two pieces. A third of the greenery is folded into a jar. Put the tomatoes, alternating them with greens. Close the lids and hold for two weeks at 15-20 ° C: the brine should become cloudy during this time. Clear the surface of tomatoes from foam and mold, add fresh brine to the container. Roll and store in a cool place. In the salting, you can add a chopped onion. Features. 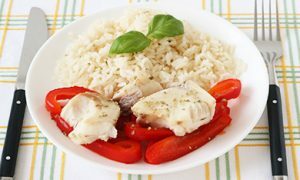 Any spices in this recipe, as in any other, can be changed to your taste, but the concentration of salt can not be adjusted. Remove sweet pepper from seeds and peduncles, cut with straw, remove peel from each clove of garlic. Place the main ingredient in the cans, alternating with layers of greens, bell peppers and garlic. In each container, if desired, put a pod of hot pepper. To withstand 10-12 days at 15-20 ° C.
Remove tomatoes from mold and foam, add fresh brine in the container. Features. Such conservation can be made more acute if you double the amount of horseradish, and cut the hot pepper before putting it in the jar. In this case, add 200 g of dill, and take salt not 400, but 600 g.
pepper spicy - on a pod on each jar. With horseradish peeled off, cut into large pieces, cloves of garlic to release from the husks and cut in half. Tomatoes put in jars, alternating with greens and seasonings. In each container, if desired, put pepper spicy. Pour brine and leave in a warm room for 12 days. Peel the tomatoes, add fresh brine, roll and place in a cool. Features. Tomatoes, salted with cinnamon, have a spicy, warming taste. In this preparation, you can add other spices, but it's better to do without dill, so as not to break the eastern flavor. leaf of laurel - 5 g.
In the cans put tomatoes between the laurel and cinnamon vegetables. Keep for 10-12 days at 15-20 ° C.
Clear the fruit, add fresh brine, roll up. Features. Such a preparation can be done without heat treatment of the fruit, but then they will turn harsh on an amateur. currant leaves - 100 g.
Tomatoes in parts to keep in boiling water one or two minutes, then cool with running water. Cool tomatoes spread on the banks mixed with greens. Fill in each container with sugar and pour in brine. In a warm place leave for six to seven days. If necessary, clean the fruit, pour fresh brine into the container. Salted green tomatoes are a popular dish in Georgia. Harvested according to the recipe described, they turn out fragrant and crunchy. Features. Carrots will not allow tomatoes to sour. Therefore, it is possible to pickle tomatoes in a cold way in a bucket or a large enamel saucepan. With tomatoes, the peduncle is not necessary to remove, it will help the fruits to keep the shape. garlic, bay leaf, parsley, hot pepper and other spices to taste. Put the tomatoes in a prepared vessel, pouring the carrots and spices crushed on a large grater. Pour the vegetables with brine. Cover the workpiece with a napkin made of natural cloth from above, put a large wooden cutting board, and press it with a load. Place the container in a cool place. Thus, tomatoes can be stored throughout the winter. As soon as the mold appears on the vegetables, it should be cleaned immediately with a clean napkin. Features. For this method, the brine is prepared in a special way. In the full volume of water you need to stir salt, sugar, add laurel. Boil for about five minutes, then cool. sugar - a small spoon. In the jar, add some greens, then tomatoes, put the peppers between the fruits. Cover the vegetables with greens and sprinkle with mustard. Pour in the brine. Close the jar. Put in the cool for three weeks. In a brine along with sugar and salt, you can mix a teaspoon of citric acid. This will give tomatoes a characteristic sourness and prolong the shelf life of the billet. Experienced housewives during the implementation of the hot method recommend near the stems of each tomato to make a puncture with a toothpick or a needle, before putting the vegetables in the jars. Such a measure will prevent cracking of the fruit. Features. This method can conserve tomatoes with apples, plums and even beets. For this, the components are laid out in this order: half green, apples (or other fruits or vegetables), tomatoes, remaining greens. garlic, black pepper peas to taste. Half the leaves and greens, garlic and pepper to send in jars, then put tomatoes, and on top again a layer of leaves and greens. Pour boiling water, wait five minutes. Carefully drain the water in a saucepan, mix in sugar and salt and boil for five minutes. At the end, add the vinegar. Pour brine into jars, roll up. Turn upside down, placing them on a tray or on a baking sheet. After the final cooling, put it in a cool place for storage. Banks can be sterilized in any way: in the oven, multivark, microwave or on a steam bath. Features. A jar with salted tomatoes in this way will not only have an unusual appearance, but a very original and memorable taste. It is desirable to take the vegetable from large vegetables. Put some of the carrot tops in a liter jar. Fill the container with tomatoes. Cover it with small branches of the tops. Pour into the pan water, stir sugar and salt, boil and stand on average heat for three to four minutes. Brine pour into tomatoes, cover and leave for 10-15 minutes. Gently drain the liquid into a saucepan, boil again and let stand on medium heat for five minutes. The container with vegetables should be covered with a lid. Pour the brine in the jar, wait seven to ten minutes. Drain the liquid in a saucepan and boil for five minutes. Crush an aspirin tablet and fill the powder in the jar. Pour the solution into tomatoes, pour vinegar into the container, cover with a lid. Let stand, rotating the jar from side to side to let out excess air. When all the air bubbles come out, turn the jar, turn it upside down and wrap it up with a blanket. A day later, put away for storage. The workpiece will be ready after two or three months. If you salt tomatoes with aspirin, tomatoes will be stored longer, and the bank will not "explode". Features. The pan should be thoroughly washed with soda or laundry soap and sprinkled with boiling water. spices to taste: garlic, pepper black peas, basil, mint, cherry and currant leaves, dill. Tomatoes sent to a pan, shifting the fruits of spices, there must necessarily be a layer of green on top. In the water, dissolve the salt, put on fire and boil for five minutes. Tomatoes laid in a bowl, cover with a large plate (the diameter should be approximately equal to the diameter of the inner walls of the pan) and pour the brine directly over the plate to the brim. Close the container with the lid. Put in the cool. Tomatoes will be ready after a month. 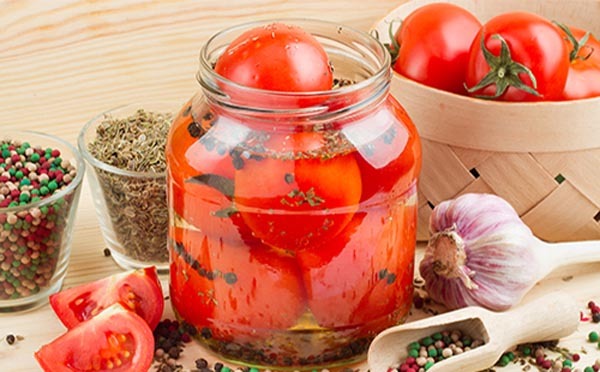 Pickling a tomato in a hot way does not allow long-term storage of vegetables in a saucepan. It is advisable after the tomatoes are ready, to spread them over the banks. Features. 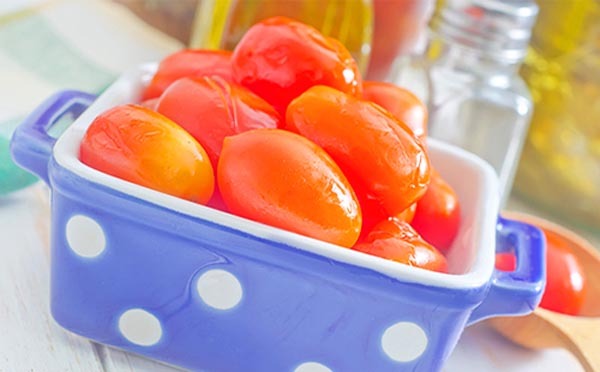 Salted tomatoes in the banks will acquire an exotic flavor, if you prepare them with honey. parsley and garlic - to taste. Garlic chop the press and mix with chopped finely parsley. From tomatoes, cut the stems with a sharp knife, making a groove to the middle of the fruit. In the resulting "pits" push a mixture of garlic and greens. Tomatoes to send to the bank. In the water stir salt and honey, boil. Drain the brine in a jar, wait ten minutes. Gently pour the liquid into a saucepan, boil. Pour into a can, tighten with a lid. Features. For stomach problems, it is better to use tomato pickles without vinegar. The described option is perfectly suitable for this, while the preservation will be ready after a few days. The peculiarity of the method is that not whole, but cut tomatoes are salted. Send dill, pepper and garlic to the jar, and cut tomatoes from above. Top with the second part of the greenery and garlic. Boil water, add sugar and salt, leave over medium heat for five minutes. Brine pour in a container with a workpiece, close the lid. Keep the day at 20 ° C.
Remove to coolness. After three days, the salting is ready. When added as a spice of celery, you can get a special, unconventional taste of salted tomatoes. 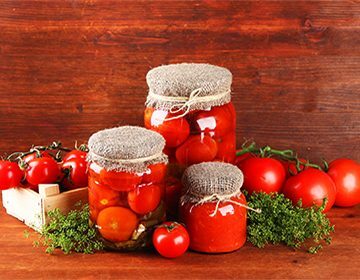 Procurement of salted tomatoes without brine involves an additional stage: the preparation of tomato puree. Here, then, and useful "illiquid" in the form of crushed and cracked fruit, which do not fit as the main ingredient in other ways. Features. The tomato mass for this recipe is prepared from blender recycled vegetables. Previously, the fruit should be peeled off. currant leaves - 15-20 pieces. At the bottom of the cans to spread the leaves, then lay the tomatoes, pour the fruits with salt, then again the leaves, again the main ingredient and again the salt. Continue until the containers are full. Pour in a container of tomato mass. Close the jars and keep six to seven days in a room where the temperature is maintained at 15-20 ° C, then transfer the containers to storage in a cool. Features. Salted tomatoes with mustard are bribed with delicate witticism. In addition, mustard acts as an additional preservative. 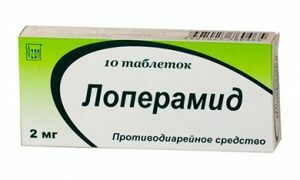 порошок горчицы – половина маленькой ложки. Из треснутых и переспелых помидоров приготовить пюре, переработав плоды мясорубкой. 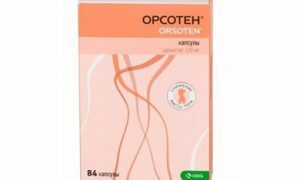 Перетереть массу через сито, чтобы освободить от семечек и кожицы. 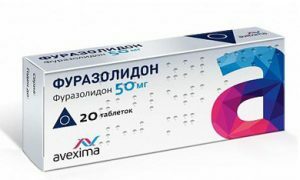 Дно банок выстлать листьями, выложить слой целых томатов, пересыпать смешанной с горчицей солью. 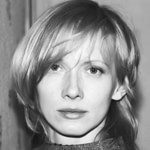 Затем последовательность повторить: листья – помидоры – смесь соли и горчицы. Продолжать, пока банки не заполнятся. 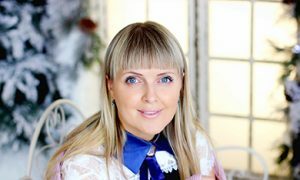 Последним слоем обязательно должны быть листья. 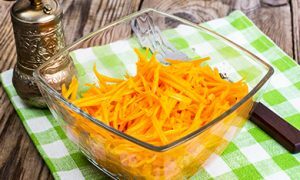 Емкости закрыть крышками, выдержать шесть-семь дней при температуре 15-20°C, затем убрать в прохладное место на хранение. It is said that if salted tomatoes appear, wait for changes, and unfavorable. Therefore, it is better to enjoy pickles not in a dream, but in reality. Moreover, to add tomatoes for the winter, you will not need any culinary talents, nor exotic ingredients. A bit of free time and a couple of interesting recipes - and the original piece is ready. Reviews: "Almost like my grandmother did"
I preserve tomatoes according to a similar recipe, in the sense, the proportion of salt-sugar-vinegar. Put the tomatoes, a little onion rings, carrot slices, garlic, red pepper slice (or more - if witty), a couple of pieces of red sweet pepper, bell pepper and Lavrushka and greens I put only celery - very fragrant and delicious brine then in a jar. For the second year I have been making such tomatoes - very, very delicious! and that, personally, for me, it is very important, always a stable result - on the 4 th day tomatoes are ideal), there was no mold. And even my terribly fastidious mother said: "Delightful! 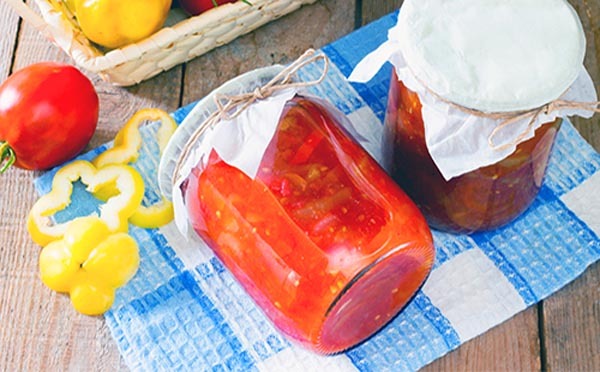 almost like my grandmother did in my childhood)) "
The most difficult thing is to prepare cans, lids and all the ingredients, the process of marinating and canning itself takes quite a bit of time. On 1 liter, the bank takes about 0.5 kg of tomatoes and 0.5 l of marinade. The exact amount will depend on the size of the tomatoes.